We are manufacturer and exporter of Material Testing Instruments for Metals, Concrete, Soil and Bitumen. Our Material Testing Instruments are beating Indian and International Standards as per customers requirement. Most of the Material Testing Instruments are manufactured in-house at our works at 107/1 Pocket D, Hastsal Industrial Area, Uttam Nagar Delhi 110059. Universal Testing Machine (UTM 400D ) is used to determine various types of strengths like Tensile, Compression, Bending/Transverse, and Shear. The Operation of the machine is by hydraulic transmission of load from the test specimen to a separately housed load indicator. The system is ideal since it replaces transmission of load through levers and knife edges, which are prone to wear and damage due to sock on rapture of test pieces. Load is applied by a hydrostatically lubricated. Main cylinder pressure is transmitted to the cylinder of the pendulum dynamometer system housed in the control panel. The cylinder of the dynamometer is also of self - lubricating design. The load transmitted to the cylinder of the dynamometer is transferred through a lever system to the pendulum. Displacement of the pendulum actuates the rack and pinion mechanism which operates the load indicator pointer and the autographic recorder. The deflection of the pendulum represents the absolute load applied on the test specimen. Return movement of the pendulum is effectively damped to absorb energy in the event of sudden breakage of the specimen. This consists of a hydraulic cylinder motor with chain sprocket drive and a table coupled with the ram of the hydraulic cylinder. mounted on to a robust base. The cylinder and the ram are individually lapped to eliminate friction. The upper cross-head is rigidly fixed to the table by two straight columns. The lower cross-head is connected to two screwed columns which are driven by a motor. Axial loading of the ram is ensured by relieving the cylinder and ram of any possible side loading by the provision of ball setting. A displacement elongation scale, with a minimum graduation of 1 mm is provided to measure the deformation of the specimen. 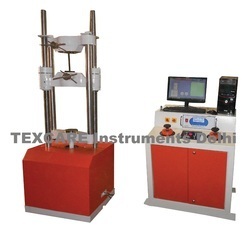 Tension test is conducted by gripping the test specimen between the upper and lower cross heads. Compression. transverse, bending. shear and hardness tests are conducted between the lower cross­head and the table. The lower cross-head can be raised or lowered rapidly by operating the screwed columns, thus facilitating ease of fixing of the test specimen.